Raymond Matinyana is considered South Africa's unofficial cultural ambassador to the Netherlands, where he has been living for the past seven years. He is the founder of the Afro Vibes Foundation, an organisation that aims to promote cultural exchanges between the two countries. Established two years ago, the foundation achieves its aims with projects, education and sponsorships. So far four students have benefited from funding and are studying in Port Elizabeth and elsewhere in the Eastern Cape. Originally from Port Alfred, he studied drama at Fuba (the Federated Union of Black Artists) for three years under the late James Mthoba. During his last year at Fuba he was awarded a partly funded scholarship by Up With People, an intercultural art education programme based in the US. As luck would have it, in 1992 he met Bart Luirink, a Dutch journalist who was attending a writers' conference at Wits University. The two struck up a friendship and Matinyana told Luirink about his financial difficulties. Knowing what the young man could do as an artist, Luirink offered to send him a ticket to come to perform in Holland and to raise money to pursue his dream. "At that time South Africa was very much in the news. A lot of people in the anti-apartheid movement wanted me to teach them music, Zulu and Xhosa for beginners. "As the word spread around, a lot of people started attending my classes," says Matinyana. "Later I was invited to perform wherever there were conferences on the future of a democratic South Africa and I met a lot of my countrymen," he says. Luirink organised a benefit concert for Matinyana and enough money was raised to enable him to take up the scholarship later that year. He joined 120 young people from around the world to stage a show called Rhythm of The World about different cultures coming together and exchanging messages of understanding. The group also performed in Germany, Switzerland, Italy and Portugal. "We went to various companies to network and to see whether there might be positions available for us when we finished with the programme," recalls Matinyana, "because not all of the people wanted to pursue a career in the arts or entertainment." In 1993 he came back to Port Alfred for two months and decided he wanted to live in Holland. He then joined Tribal Countdown, a band of African and Dutch musicians as a vocalist. Tribal Countdown later split up and he started another group, Afro Vibes Band, with musicians from Brazil, Surinam, Indonesia, South Africa and Holland. "I found the Dutch to be liberated in so many ways. You are not an evil person if you decide to smoke dagga or express your sexuality openly. "I learnt a lot about their culture and more about my own country. "It has been a healing process to be part of the country where the Afrikaners originally came from and to be treated as an equal without any pretences," he says. During a visit home in 1998 he was shocked at the level of alcoholism and violence that had affected teenagers in the Port Alfred area. The Dutch visitors were constantly asked for money by the youngsters, who claimed that they did not have money to complete their tertiary education. 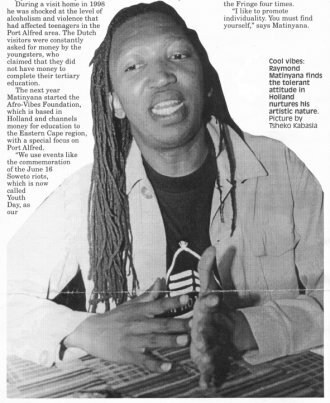 The next year Matinyana started the Afro Vibes Foundation, which is based in Holland and channels money for education to the Eastern Cape region, with a special focus on Port Alfred. "We use events like the commemoration of the June 16 Soweto riots, which is now called Youth Day, as our main way to raise funds by using art and culture from home to raise awareness about the plight of those kids," he says. Visitors to the Grahamstown Festival might remember Miss Thandi, Matinyana's drag and cabaret act, which has been invited to the Fringe four times. "I like to promote individuality. You must find yourself," says Matinyana.